Benchrite “Wick Style” Cleaning Jags are patterned after jags made by Dave Wick, a good benchrest shooter from the Cincinnati area some years ago. Many shooters who had a Wick jag treasured it and felt it was absolutely the best cleaning jag ever made, and we agreed. Our jags are made just like Dave Wick’s, same hard steel super sharp point, same back-cut flutes to hold the patch, same sizing as Wick’s for the various calibers. We offer male ended (8-32 thread) or female ended (8-36 for Dewey rods) in 22 cal., 6mm, and 30 cal. Shooters who use 1 ¾” square patches for 6mm barrels will probably like the fit of the 22 cal. jag, those using 1 3/8” patches will like the 6mm jag. These jags work perfectly for any regular solvent – the patch drops off when the jag exits the muzzle, but they are also excellent for paste type cleaners like JB or Iosso since they grip the patch so well. 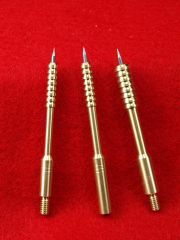 Try one of these Benchrite “Wick Style” Jags – you will never want to use an ordinary jag again. Please visit our NEW Web Site at www.benchrite.com Pricing: Benchrite “Wick Style” Jag $15.00 each Postage and handling (First Class Mail) $4.95 Visa, Master Card, Discover, Personal Check gladly accepted.